Autumn is one of my favourite months, I really love it when Summer comes around and it warms up but after a few weeks I get bored of the hot weather and can't wait for Autumn to arrive! The temperature is perfect in Autumn, it isn't freezing cold but not boiling hot either! Also I love sitting inside in a cosy jumper watching the leaves fall from the trees. Autumn is the sign to get my onesies back out again as well! 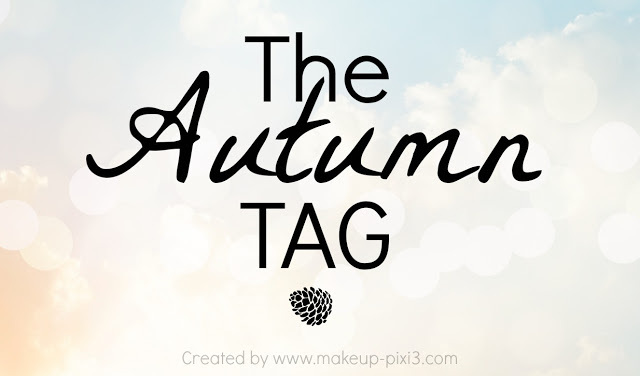 Seeing as I love Autumn so much it seemed appropriate to do this tag which the lovely Georgina created! I think my favourite thing about Autumn has to be the fact that it brings cooler weather with it meaning I can wear my jumpers and onesies! Who doesn't love being cosy in a soft jumper? This is difficult as I really don't like hot drinks, I sometimes (very rarely!) drink hot chocolate though. I'll be sticking to my Iced Tea throughout A/W I think! My answer couldn't be any more beauty blogger stereotypic! My favourite Autumn scent is the Bath and Body Works Leaves candle! Mine ran out a few months back and I really wish I could buy another for this Autumn, we really need a few Bath and Body Works shops in the UK! It honestly just captures Autumn in one scent! I can see my go to Autumn Lip Product this year being Rimmel's Kate Moss Lipstick in 08. It is still pink, the colour I mainly wear, but it is a darker pink and very Autumn appropriate! I really love wearing it but during summer I think it was just a little too heavy so I can't wait to start wearing it again! Mine is the Johnsons 24hr Hydrating Day Cream, I'm currently using the normal skin version but I'll be picking up the version for dry skin as the days get colder! Definitely purples! I already have a few purple eyeshadow palettes ready to test out this Autumn. I tend to lean more to matte shades more in the A/W, no idea why though! Definitely a bit of Mumford and Sons. I have no idea why but I seem to connect folk/country bands with Autumn? Also a band I've been loving recently is We the Kings so I'm sure their songs will be on play throughout all of Autumn! I'll definitely be getting my skinny jeans back out again this year to wear with jumpers and some ankle boots! Also though I'm looking forward to wearing dresses with thick tights and jumpers and I can't wait to wear my snood again, everyone needs a snood! I'm definitely going to be treating myself to some nice boots this A/W, I've got my eye on a few pairs from New Look at the moment! I think I'll treat myself to another snood as well, maybe in a colour that is easier to wear, my green one doesn't go with everything! Definitely inside! Preferably wearing a onesie, eating some soup and watching a bit of TV! I love this tag and decided to do it too. You're blog is lovely by the way!